In an 8 quart stock pot, melt butter on a low to medium heat, add onions and bell peppers, sauté until transparent. Add whole corn, cook 20 minutes. 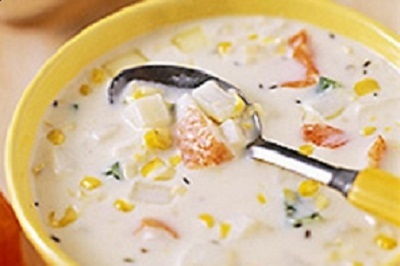 Add cream corn, cook 10 minutes stirring frequently. Add cream, chicken broth and seasonings, cook 20 minutes. Add seafood and cook for 15 minutes, or until shrimp are cooked. Slowly add cornstarch mixture, until desired consistency is reached. Add parsley flakes and onion tops, cook 5 minutes. Serve hot. If you can find little bread bowls you can serve the soup in there.